Xindal-300 Capsule: Each capsule contains Clindamycin Hydrochloride USP equivalent to Clindamycin 300 mg.
Xindal-150 Capsule: Each capsule contains Clindamycin Hydrochloride USP equivalent to Clindamycin 150 mg.
Clindamycin has been shown to be effective in the treatment of the following infections when caused by susceptible anaerobic bacteria or susceptible strains of gram positive bacteria such as Streptococci, Staphylococci and Pneumococci: upper respiratory tract infections, lower respiratory tract infections, skin and soft tissue infections, bone and joint infections, pelvic infections, intra-abdominal infections, septicemia and endocarditis, dental infections. As an alternative therapy when used in combination with quinine or amodiaquine for the treatment of multi-drug resistant Plasmodium falciporum infection. Clindamycin is contraindicated in patients previously found to be sensitive to Clindamycin or lincomycin or any of the ingredients of this medicine. Serious Infections: 150 mg - 300 mg every six hours. More severe infections: 300 mg - 450 mg every six hours. Serious Infections: 8 - 16 mg/kg/day divided into three or four equal doses. More severe infections: 16 - 20 mg/kg/day divided into three or four equal doses. The adverse effects have been reported with the use of Clindamycin are abdominal pain, oesophagitis and oesophagial ulcer, nausea, vomiting and diarrhoea, pruritus, skin rashes and urticaria. Clindamycin should be prescribed with caution in individuals with a history of gastrointestinal disease, particularly colitis. Pregnancy Category B: Clindamycin crosses the placenta in humans. After multiple doses, amniotic fluid concentrations were approximately 30% of maternal concentrations. Clindamycin should be used in pregnancy only if clearly needed. Clindamycin has been reported to appear in breast milk. Therefore, it is not recommended for nursing mothers if not clearly needed. When Clindamycin is administered to newborns and infants (birth to 16 years) , appropriate monitoring of organ system functions is desirable. Clindamycin enhance the action of other neuromuscular blocking agents. Therefore, it should be used with caution in patients receiving such agents. Antagonism has been demonstrated between Clindamycin and Erythromycin in vitro. Because of possible clinical significance, these two drugs should not be administered concurrently. Xindal-300 Capsule: Each box contains 30 capsules in Alu-PVC blister pack. 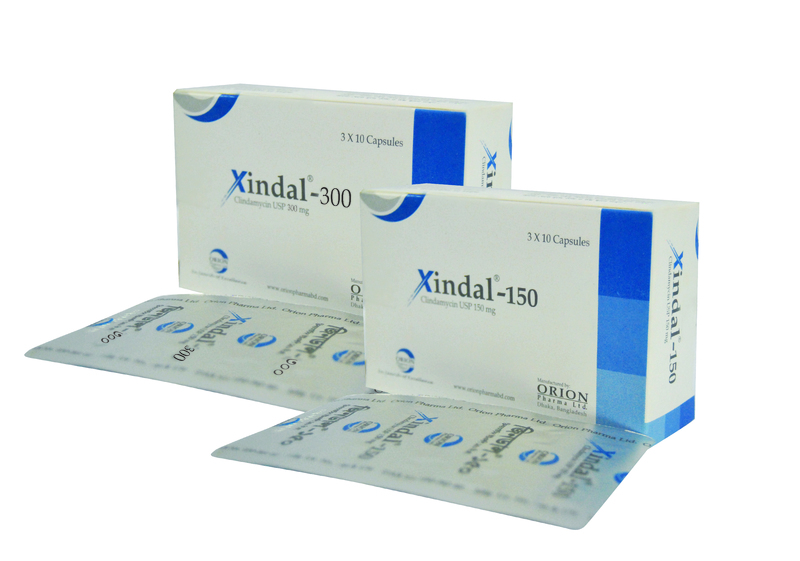 Xindal-150 Capsule: Each box contains 30 capsules in Alu-PVC blister pack.